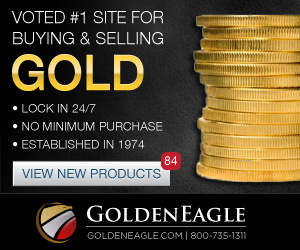 For the 1980 proof set, the US Mint introduced a new, smaller package design for the six coins by taking advantage of the smaller diameter of the dollar coin. 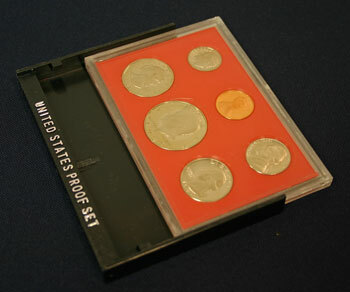 The proof set contained six coins: the Lincoln cent, Jefferson nickel, Roosevelt dime, Washington quarter, Kennedy half dollar and Susan B. Anthony dollar which equaled $1.91 in face value. 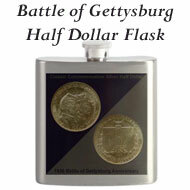 The initial price from the US Mint for the 1980 proof sets was $10.00 each. 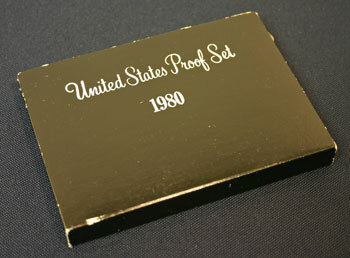 The new design for the 1980 proof set, which continued for 1981 and 1982, used a similar shiny black outer box with silver script identifying the set as "United States Proof Set" with "1980" centered underneath. 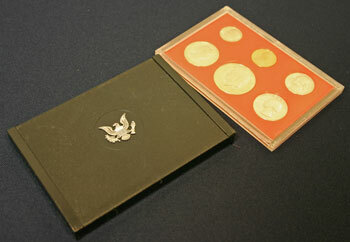 The box differs, however, in its dimensions of roughly 3 1/2 inches by 4 7/8 inches by 1/2 inches. 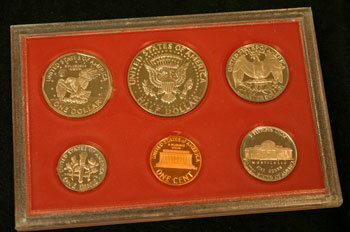 Also, the box is open at the top unlike earlier and later proof set boxes that enclose the lens holding the coins. 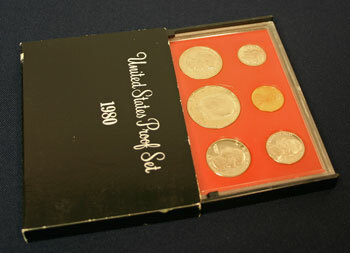 Like the earlier black proof sets, the 1980 proof set included a display stand. 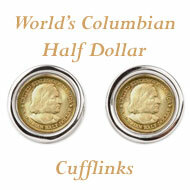 But, the new design introduced a separate piece of plastic to hold the lens with the proof coins. 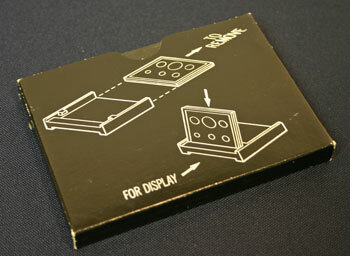 The back of the proof set box showed, in silver colored outline, how to remove the lens and place it in the display easel. 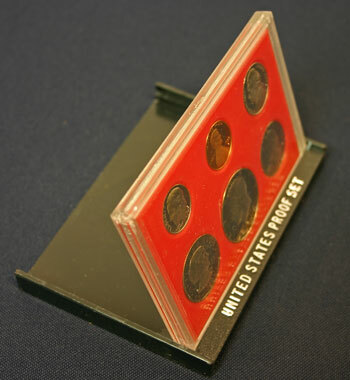 Rather than having an enclosed box, the 1980 proof set has an open edge where the proof coins' lens in its display stand holder enter and exit the box. After removing the proof coins' lens in its black holder from the proof set box, the lens slides out of the black plastic holder. The lens holding the six coins and the black plastic display stand are two physically separate pieces. 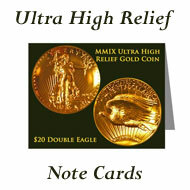 On one side of the black plastic holder (seen above) "UNITED STATES PROOF SET" is centered across the bottom in raised, silver-colored letters. 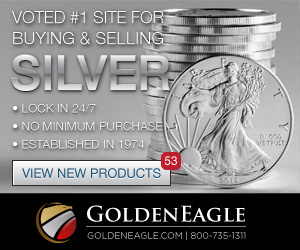 A silver-colored heraldic eagle is centered on the opposite side of the black plastic. 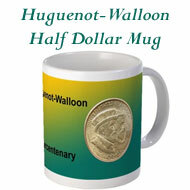 To display, the lens holding the proof coins is inserted in the space between the two black tabs and the edge with the letters. 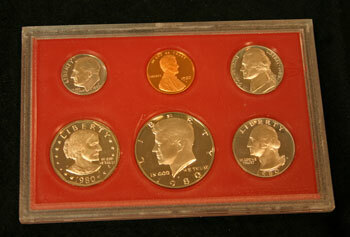 For the most part, the 1980 proof sets included cameo and ultra-cameo proof coins. 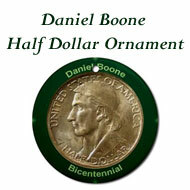 In rare cases as a variety, collectors find a re-punched mint mark on the Susan B. Anthony dollar. 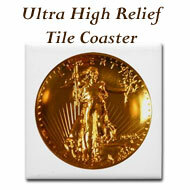 The coins are held in individual circles in a red plastic insert sealed between two clear plastic covers. 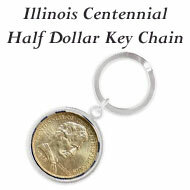 The dime, penny and nickel are spaced evenly across the top of the proof set with the dollar, half dollar and quarter across the bottom. 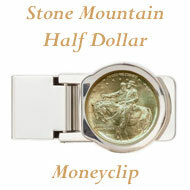 Turning the lens over, the reverse of the coins can be readily seen through the clear plastic cover. The world population in 1980 was 4,452,942,594. This represents 65.0% of the world's population in 2010. 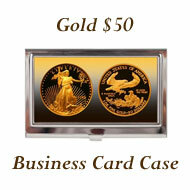 $100 in 1980 equals $264.63 in 2010 dollars using the Bureau of Labor Statistics' Inflation Calculator. 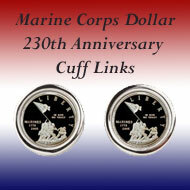 New houses in 1980 cost an average of $76,400 which would be $202,177 in 2010 dollars. 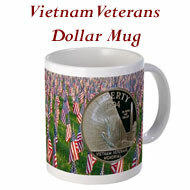 The average income was $12,513 per year which equals $33,114 in 2010 dollars. Gas was $1.191 per gallon which would be $3.152 in 2010 money. The average new car was $7,574 equivalent to $20,043 in 2010.